The Salzkammergut region of north west Austria is widely acknowledged as one of the most beautiful in this country of lovely landscapes. This district boasts 76 lakes, majestic mountains that rise some 6,500 feet and forest clad hillsides. If you have seen the film “The Sound of Music” then you have glimpsed some of the Salzkammergut’s glories already. The story was set in this area and many holiday makers enjoy identifying places shown in the musical. The picturesque church in the lakeside village of Mondsee was used for the wedding scene, for example. Wonderful scenery, delightful Salzkammergut villages and historic cities such as Salzburg await you on this tour. The 3 star Hotel Tirolerhof is situated a short drive away from the Attersee Lake in the centre of the village of St Georgen in Attergau. A charming family run hotel which offers an extremely warm welcome to all of its guests. The hotel is furnished in typical Austrian style with superb home-made cuisine. The hotel also offers a varied entertainment programme during your stay. In addition the hotel has a pleasant garden with its own swimming pool. All rooms are well appointed and en-suite. Some rooms may be in the adjacent guest-house and are furnished to the same standard as the main hotel. Half Board. Single Supplement £100pp. DAY 2 – We make our way to the excellent Tirolerhof Hotel in the charming town of St Georgen im Attergau. DAY 3 – A truly scenic trip today. Firstly we board the train and make the ten minute ride to the lake of Attersee, where we take a boat cruise around the northern part of the lake, passing various idyllic villages which line the shore, before returning to St Georgen via the return train journey. 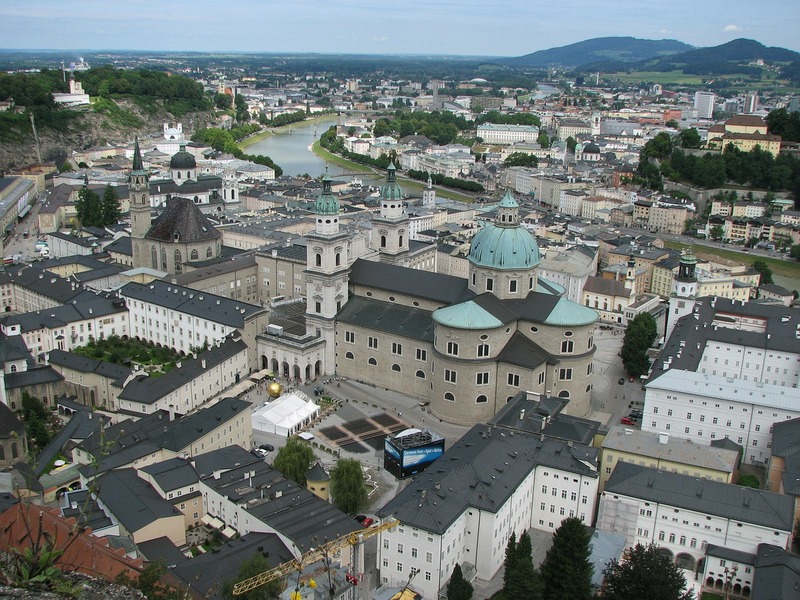 DAY 4 – Visit one of Europe’s finest cities today, Salzburg. Here you can visit attractions such as Mozart’s birthplace, the Mirabel Palace, take a pony and trap jaunt around the city or simply relax in one of the many cafes or bars on the historic “Getreidegasse”. DAY 5 – A free day to enjoy the delights of the pretty town of St Georgen. DAY 6 – Travel to the spa resort of Gmunden and the villages of Altmünster, Traunkirchen and Ebensee, which are all set in the mountains on the shores of Traunsee lake. Take a relaxing cruise on the lake, and return back to our hotel via the opposite bank of Lake Attersee. DAY 7 – Set off on our way to the beautiful Lake District, firstly driving around the lake of Attersee before visiting Mondsee, whose church was used for the wedding scene in The Sound of Music film. From here we drive to St Gilgen to Lake Wolfgangsee and the village of St Wolfgang, said to be the prettiest village of the area. DAY 9 – After breakfast, we continue our journey home.